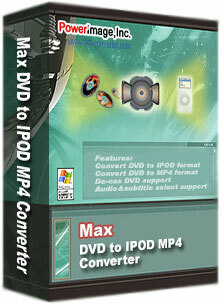 Max DVD to IPOD MP4 Converter is a high speed DVD to IPOD movie file format converter. Full DVD disc convert or just a clip are supported . The built in MP4 AVC(H264) encoder is more powerful and simply. MPEG4 and H264 encoder are built in for video codec. MPEG4 AAC-LC is built in for audio codec. You can add new output format with the supported video codec and audio codec and some other paraters to fit the best quality play on your own IPOD.